This week I’ve been reading about the “back stories” of the saints. It can be easy, sometimes, to think of holy people in two-dimensional, sanitized terms. Earthbound angels who floated through life, never contradicting, never offending . . . warm and appealing and endlessly agreeable. Yet “niceness” is not a theological virtue, and those who march to heaven’s score sometimes end up treading on a few toes – or avoiding it only by escaping into the desert. The reality is more complex. Years ago, when I was a fledgling editor, I was sent to a local seminary to discuss a manuscript with a Jesuit priest, a prolific writer who was widely regarded a living saint. I brought with me his manuscript, which had been edited by my (male) predecessor. Silently he flipped through the marked-up pages, his frown turning to an outright scowl. Finally he pushed aside the papers and turned to me with barely concealed anger. “You feminists are all alike! Inserting all this gender-inclusive language into my work!” He continued like this for several minutes, while I sat there stunned and not a little defensive. In point of fact, I had not made the changes – I detest gender-inclusive language, and had no part in making the changes. It was the beginning of a short but memorable working relationship; the priest died shortly before his book was released. His cause for canonization was opened a few years later. It is this pursuit of a pure heart – this urgent desire to be like our brother, Jesus, and to have a heart like his – that is characteristic of a “saint in the making.” And no time are we more like Christ than when we recognize his image in the world, the “Jesus in distressing disguise,” as Blessed Mother Teresa used to call it. When we love that churlish child, that cantankerous priest, that lonely soul, our own rough edges are sanded by the Divine Carpenter. Last week we remembered all those who loved – or inspired us to love – with this kind of courageous abandon. 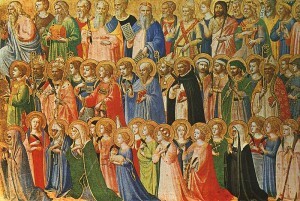 On All Souls Day, we think of “saints in the making,” who have gone before us to start their final approach to heaven. Those who loved God and lived to please him . . . not always perfectly, but with all their hearts. We didn’t always understand them while they walked among us. But thankfully, they now understand us perfectly, and pray for us in the clear light of heaven even as we continue to pray for them. Lord Jesus in your mercy, guide us with confident steps to the Kingdom, where we may participate in that city of joy. Keep our loved ones safe, until we are no longer saints in the making, but find true and lasting happiness in your ultimate reality. Next Article Massachusetts Question 2: Dignity or Deception?